(UPDATED) How did AlDub second date #ALDUBEBforLOVE and #ShowtimeKapamilyaDay fare in ratings game? According to AGB Nielsen data, Eat Bulaga was able to get a TV rating of 45.7%, now making it the highest TV rating in Mega Manila for 2015. Last Saturday, September 26, Eat Bulaga and It's Showtime marked milestones for both shows. ALDUB SECOND DATE. Last Saturday, September 26, Alden Richards finally went to Lola Nidora’s (Wally Bayola) mansion to officially court Yaya Dub a.k.a. Maine Mendoza. Before going to Lola Nidora’s house, Alden first sang “God Gave Me You” in the Broadway studio. This was after Lola Nidora requested him to sing it live before courting Yaya Dub. After many mishaps, Alden finally reached Lola’s mansion while bringing four bouquets of flowers for Yaya Dub, Lola Nidora, Lola Tidora (Paolo Ballesteros) and Lola Tinidora (Jose Manalo). Alden also brought food, including Lola Nidora’s wish: chicharon. Before Alden had his time with Maine, Lola Tidora and Lola Tinidora gave Alden a tour of the mansion. After a while, Lola Nidora finally came down from the stairs. Alden paid his respects by blessing Lola Nidora’s hands and giving her a bouquet of flowers. Finally, Yaya Dub went down the stairs wearing a red dress. When it was time for their merienda, they first played Trip to Jerusalem to determine their seats. When they started eating, Tidora and Tinidora stood up to give Alden and Yaya Dub their own time. They even brought Lola Nidora along with them. When the two were left with each other, they enjoyed together exchanging Dubsmash acts while eating cake and palabok. While eating, Yaya Dub suddenly choked, which is why Alden gave her a glass of water, prompting the two to almost hold hands! After a while, the mayordoma of the mansion, Rihanna (also played by Wally) went down and had her selfie taken with Yaya Dub and Alden. Alden then requested to have his selfie taken with Yaya Dub! Tidora and Tinidora then also went down and had their photos taken with Alden and Yaya Dub. They were followed by Lola Nidora and she said that it’s already time for siesta – saying that Alden’s time to visit is up. Before Alden left, Yaya Dub handed a letter to him. The official hashtag of the episode #ALDubEBforLOVE reached a total of 25.6 million tweets or almost doubling the last record of 12.1 million. SHOWTIME KAPAMILYA DAY. This day was called ANIM-versary kick-off celebration to start the month-long celebration of It's Showtime's sixth anniversary celebration. 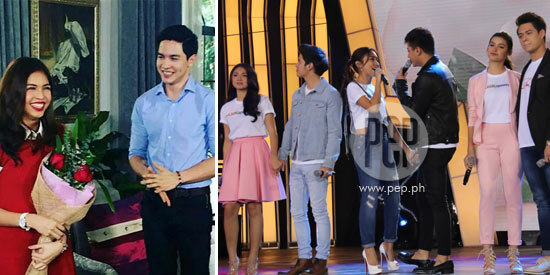 This event was highlighted by the performance of three hottest loveteams of ABS-CBN: Jadine, Kathniel, and LizQuen (James Reid, Nadine Lustre, Kathryn Bernardo and Daniel Padilla, and Liza Soberano and Enrique Gil). Viewers were also shocked when Vice Ganda's male alter ego, Viceral, suddenly kissed Karylle on the lips. The hashtag #ShowtimeKapamilyaDay garnered 6.4 million tweets at the time. MEGA MANILA RATINGS. How did Eat Bulaga and Showtime fare based on data from TV ratings data supplier Nielsen TV Audience Measurement? Almost half of the viewing public in Mega Manila tuned in to witness the second date of Alden Richards and Yaya Dub. Eat Bulaga was able to get a TV rating of 45.7%, now making it the highest TV rating so far for 2015. This figure means Eat Bulaga shattered its own previous record of 43.1%. KANTAR NATIONWIDE RATINGS. Eat Bulaga and It's Showtime had an eight-point difference in their TV ratings, based on data from Kantar Media. Based on national ratings (Total Philippines, Urban and Rural) of Kantar Media, Eat Bulaga was able to get a TV rating of 30.8%, allowing it to become the second most-watched program that day. The No. 1 slot went to Maalaala Mo Kaya, which got a TV rating of 31.9%. This particular episode featured the life of The Voice Kids Season 2 winner Elha Nympha. ABS-CBN's noontime show, It's Showtime, registered a TV rating of 22.5%.